Last weekend’s election results may have arguably presented a new dawn for our industry, with Australia’s most influential business and industry groups undoubtedly applying pressure on the Coalition to reduce penalty rates for workers on Sundays and public holidays. Technically, this wage cut should make it easier for businesses in our industry to employ more staff. While the new political landscape comes as a welcome relief and added security, this does not change the fact that the hospitality Industry has a chronic rate of high staff turnover, with every employee you lose costing your venue up to $45,000 to replace! While a Coalition Government will act in the interest of businesses, it is important to consider that wage cuts may have a negative impact on attracting new employees. In that case, what can your venue do to keep your star team members – the ones who exercise their initiative, who turn up for their shifts on time and train or supervise new employees? Allocate KPIs (key performing indicators): A staggering 31% of employees leave their jobs due to a lack of empowerment within their role. When you invest in your employee’s training so they can improve your venue’s KPI’s, you’re helping them become part of the bigger picture. You should also encourage innovation when it comes to tackling a KPI from a different angle – your staff are more likely to thrive and succeed when they feel they have the power to make a significant contribution. Give credit where credit’s due: I’m sure we’ve all worked in a job where hard work went unnoticed, and I’ll bet you didn’t hang around long either! According to Forbes Magazine, 41% of staff will drop a job like a hot potato where there is zero recognition or appreciation. 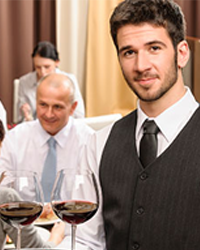 Recognition can range from thanking staff for handling a busy night at the bar, or giving star performers a wage bonus. Acknowledgement is one of the simplest, yet most effective ways of creating a positive work environment and improving staff performance. So who do you need to thank today? Train and Retain: Often reserved for managers, training is one of the most effective ways to engage your staff and should be extended to the frontline staff where possible. Thanks to recent funding from the State Government, there is an exciting opportunity available for you to now train any of your staff (including casuals) so they can gain more practical and theoretical understanding of hospitality that will help them excel in their role. Better still, you can access this training at a fraction of the price. Investing in a Certificate III in Hospitality for your staff will enable them to reach their KPIs, while acknowledging their efforts through a cost effective reward. While the new Federal Government will present some interesting opportunities and challenges for our industry, education remains to be one of the most effective methods of retaining staff and helping your venue create a succession plan.